Dr. Elizabeth Rave in the Midway Islands. 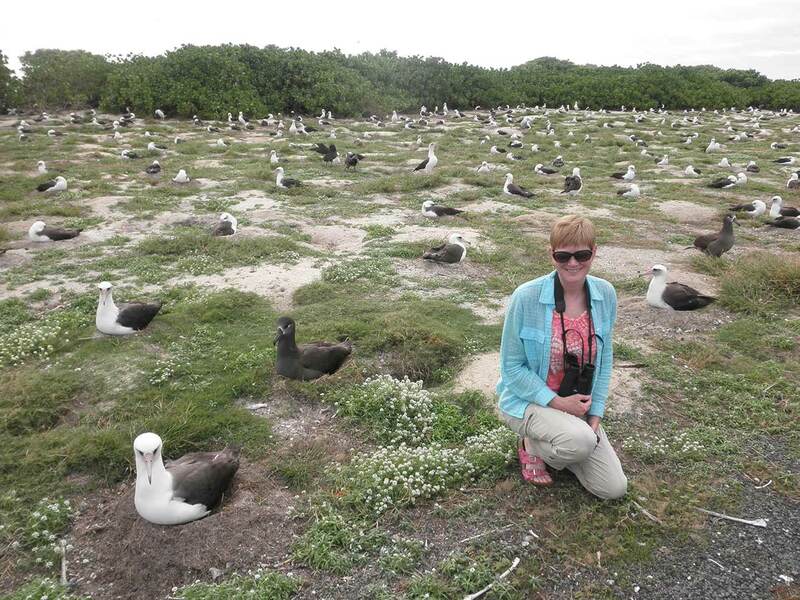 Dr. Elizabeth Rave, professor of biology at Bemidji State University will return to the island of Midway, located near Hawaii, to continue her research on Laysan and black-footed albatross on the Midway Atoll National Wildlife Refuge. In Dec. 2016 and Jan. 2017, as part of her sabbatical, Rave was one of 18 volunteers chosen by the U.S. Fish & Wildlife Service to support its annual survey of Midway’s albatross population. This year, Rave will again join a team of biologists who will monitor the breeding populations of Laysan and black-footed albatross. Rave decided to return to Midway because her prior experiences were so amazing. She said her team counted more than 585,000 Laysan and black-footed albatross nests during the survey — nearly 1.2 million birds in breeding pairs. Every year, the U.S. Fish & Wildlife Service receives applications from people who want to be involved in a census. This application process is one of the few ways scientists can go to Midway because the island is closed off to the public. It becomes a competitive process as not all applications are accepted. Rave was one of the lucky few chosen to return and continue her research on the remote island. Rave’s doctoral research was done on Hawaiian geese, and during her first sabbatical over a decade ago she researched Hawaiian ducks. She will leave on her 2018 Midway sabbatical in mid-December and will be gone for four weeks. The Midway Islands are unincorporated U.S. territory in the Hawaiian archipelago — but not part of the state of Hawaii — located approximately 1,300 miles northwest of Honolulu. The islands — Eastern Island and Sand Island — have a total surface area of approximately 2.4 square miles and sit on a coral atoll which has a circumference of approximately 15 miles. The Battle of Midway, a pivotal conflict in World War II’s Pacific Theatre, was fought in the waters near Midway in June 1942. During the battle, which was fought nearly exclusively with naval aircraft, the U.S. Navy destroyed most of Japan’s aircraft carrier capacity and effectively eliminated the threat of further Japanese invasion in the Pacific. The Navy continued to operate on Midway in some capacity until 1993. Midway was designated as the Battle of Midway National Memorial in 2000. Midway is closed to public visitation, with the U.S. government allowing only activities that directly support airfield operations and conservation management of the refuge and memorial and the islands’ monuments.